Brendan Milos has continued his journey of creating artwork for many of the enemies of Majora’s Mask as part of our Enemy Artwork Project. This is a collaborative fan project to create artwork for all of the Majora’s Mask Enemies in the game. This time around he tackles an enemy Shell Blade. 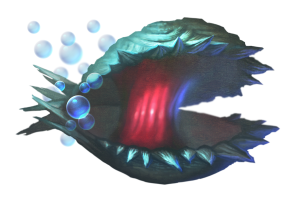 These pesky enemies first appeared in the Water Temple of Ocarina of Time but re-appear in water based regions of Termina, including the Pirates’ Fortress and the Great Bay Temple. They will open their mouths for a short period of time, revealing their weakspot, before then charging at Link with their shell. You can see a thumbail version of the image to the left, but go ahead and make the jump to see the full sized image, along with where you can find some of Brendan’s other pieces of enemy artwork. What enemy or mini-boss would you like to see Brendan illustrate next? He is taking requests in the comments below, so be sure to let us know what you’d like to see. Below is the newest piece of fan artwork and you can click it to view a larger version. You can also check out our Majora’s Mask Enemy Gallery to see all of Brendan’s artwork to date.